At Grimmer Motors, we provide cabin air filter replacement for your vehicle in Hamilton. We are able to source and fit the correct air filter for your car, improving air circulation and quality inside your vehicle. A dirty cabin air filter compared to a new, unused cabin air filter. A cabin air filter helps prevent contaminants such as dust, pollen and dirt from passing through your air conditioning system and entering your vehicle. This allows for a much cleaner breathing environment for everyone in the vehicle. Cabin air filters are particularly useful for drivers/passengers that suffer from allergies or respiratory problems. If you regularly drive on unsealed roads, your cabin air filter will become dirty at a faster rate. This is because unsealed roads will force contaminants into your vehicle. Over time, your vehicle’s cabin air filter will lose effectiveness. This is due to particles becoming stuck in the filter. A dirty cabin air filter will result in a poor air flow from your air-conditioning / heater system. 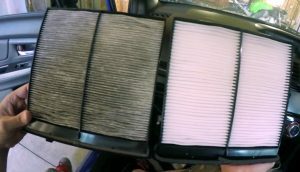 A dirty cabin filter may also produce a damp, musty smell inside your vehicle. For cabin air filter replacement from skilled mechanics, bring your vehicle to Grimmer Motors. We are conveniently located on 998 Heaphy Terrace, Fairfield.